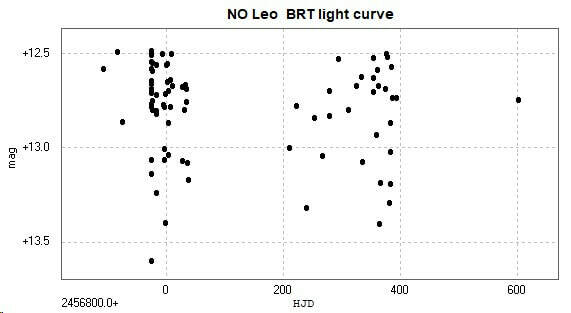 Light curve, period search and phase diagram of the EW type eclipsing binary NO Leonis. Constructed from 82 unfiltered images taken by the Bradford Robotic Telescope Cluster Camera (BRT) between 5 February 2014 and 14 January 2016. 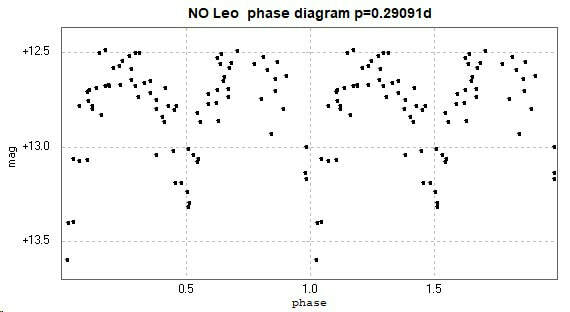 NO Leo is in the field of my object star AP Leo and the images are not correctly exposed for NO Leo. The best fit period to this data is 0.29091 days, which compares to the AAVSO VSX value of 0.29091013 d.